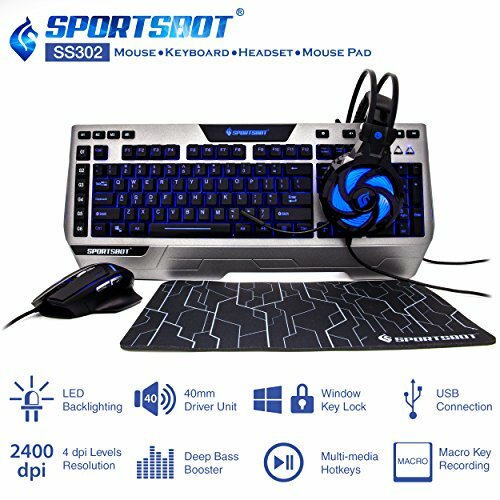 3 LED BACKLIGHTING & BREATHING LIGHT EFFECT OPTIONS: Features 3 LED backlighting options on keyboard (Blue, Red, Purple) and 4 LED backlighting on mouse. 3 brightness setting for keyboard to improve visibility in low-light condition and breathing light effect option on keyboard. PROGRAMMABLE MACRO KEYS & 3 MACRO MODES: SS302 Features 6 programmable macro keys and 3 macro modes that combines up to 18 different macro combinations. OVER-EAR STEREO BASS HEADSET: SS302 headset features high strength suspension handband, 40mm speaker, leather headset cover, adjustable high quality microphone, and in-line volume control and bass booster switch. 5 + 1 (SCROLL WHEEL) BUTTONS: DPI button for 4 changeable levels of dpi resolution (800/1200/1600/2400) with different corresponding LED backlighting colors, forward button, backward button, right mouse button, left mouse button, & large high-precision scroll wheel. ERGONOMIC DESIGN, STABILITY, DURABILITY: Both keyboard and mouse are ergonomic design for long-term comfortable use. Special padding on both keyboard and mouse to add stability. High-quality ABS construction to improve durability. If you have any questions about this product by Soundbot, contact us by completing and submitting the form below. If you are looking for a specif part number, please include it with your message.